This statement is very powerful as it notes the relationships we establish and contributions we make towards the lives of other people and society. Our history, memories and character is not forgotten once we pass on and simply noted by a name on a tombstone. No, we all touch the lives of others and leave behind elements that carries on long into the future. On July 27, 2010, The French Shore Historical Society cordially invited me to attend their official grand opening of the French Shore Tapestry, at the French Shore Interpretation Centre, Conche, NL. Other commitments prevented me for being there on this day. However, the newspaper noted that more than 200 people showed up for the festivities, which more than doubled the Town’s population. I did visit the facility back on June 29, 2010 with a friend who lives in Montreal, Quebec. Enroute, to Conche I saw a black bear cub. My first bear sighting ever on the island of Newfoundland! The road is a number of unpaved kilometers, but certainly worth the trip. As you loop into the Town of Conche, there are look-outs and well placed signage directing you to attractions of the French Shore. At the centre (formerly a nursing station established by the International Grenfell Association) there are informative panels and artifacts, as well as pleasant staff to answer any question you may have. 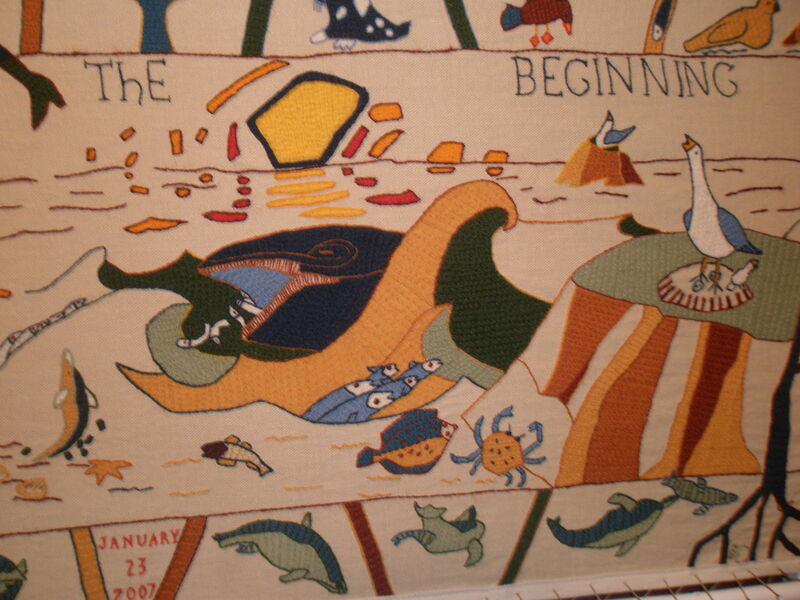 The crown jewel of the exhibit is a 222 foot Tapestry that depicts the history of the French Shore of Newfoundland and Labrador from the very beginning. The stories were designed and sketched by renowned artist J.C. Roy. Then the images were stitched by a group of women from Conche onto Jacobean linen and embroidered with crewel wool. The process had taken three years to complete, many long tiring hours, the trial of more vibrant colours and increased levels of difficulty to produce this extraordinary hand-stitched piece of art, that is simply one of a kind and forever a part of our rural Newfoundland & Labrador history. 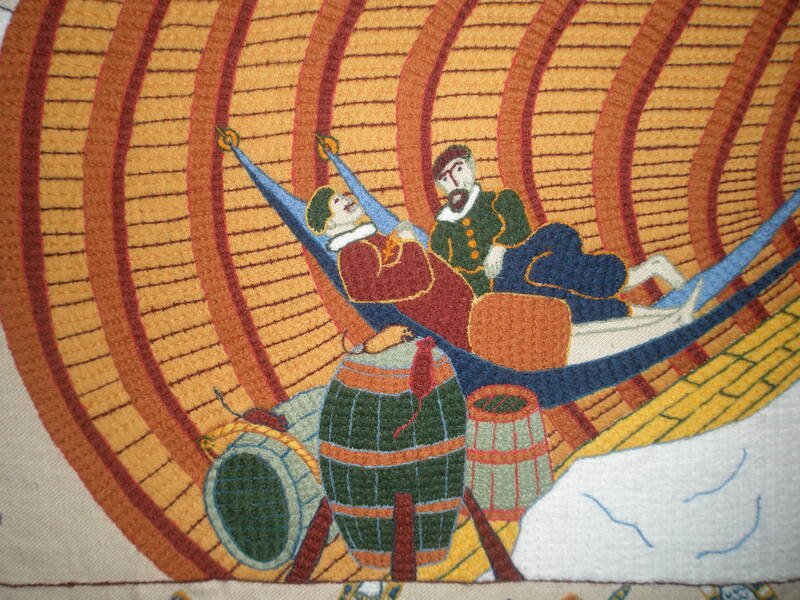 The tapestry includes animals, native Aboriginal groups, the Norse, Basque, English, Irish, French and transitions to the current settlers. It is a remarkable timeline from the beginning to present. A walking trail pass the French Bread Oven, led us to a magnificent view of a quaint little down that is rich in history and big on charm. This Town has an Artist’s Retreat. It is no wonder! The perfect place to truly get-a-way from it all and find your inspiration. Another noteworthy stop was a visited to the remains of a World War II plane crash. The occupant survived, but remnants of the wreckage are preserved on site to this day. 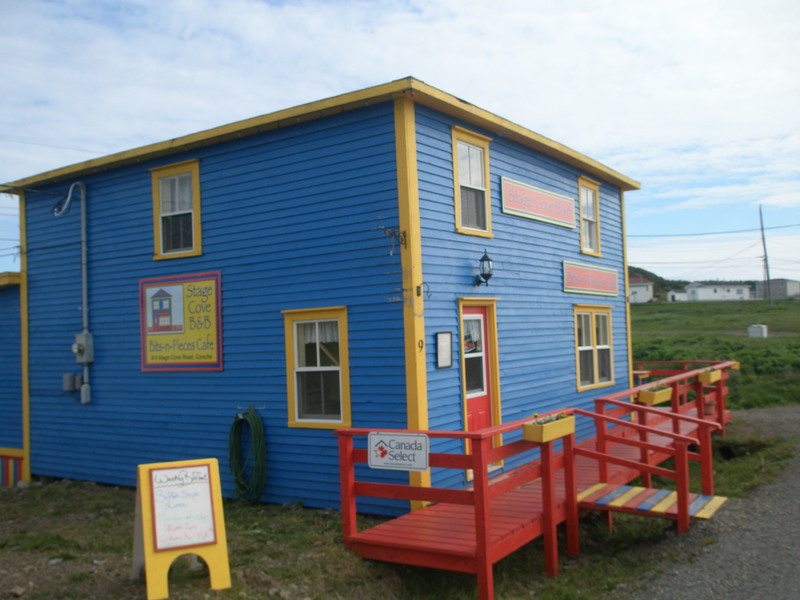 Finally, not trip to Conche could be complete without a visit to Bits-n-Pieces Cafe (which is also Stagehead B&B). This old salt-box home has been completely restored after receiving a lot of tender loving care. It now shines with a splashy blue coat of paint and bright sunshine trim. I enjoyed a nice cup of coffee served with homemade French fries from potatoes grown in the garden and delicious fish cakes. If this place is not recommended by Where to Eat Canada, it damn well should be! It certainly was a treat to meet the youthful owner. It is refreshing to see people follow a dream and choose entrepreneurship as a viable career option. Before leaving I purchased an original piece of art, entitled “The Lonely Harbour”. It was painted locally with a transparent fisherman alone, mending his net. There were others, but this one stood out as my father was a fisherman. It certainly can be a struggle. I admire the passion of those who continue to choose fishing as a profession. There are many challenges, long tiring hours, typically modest income and significant dangers. I am waiting to frame this print, most likely it will hang in my office. Each glance will bring me closer to my father. 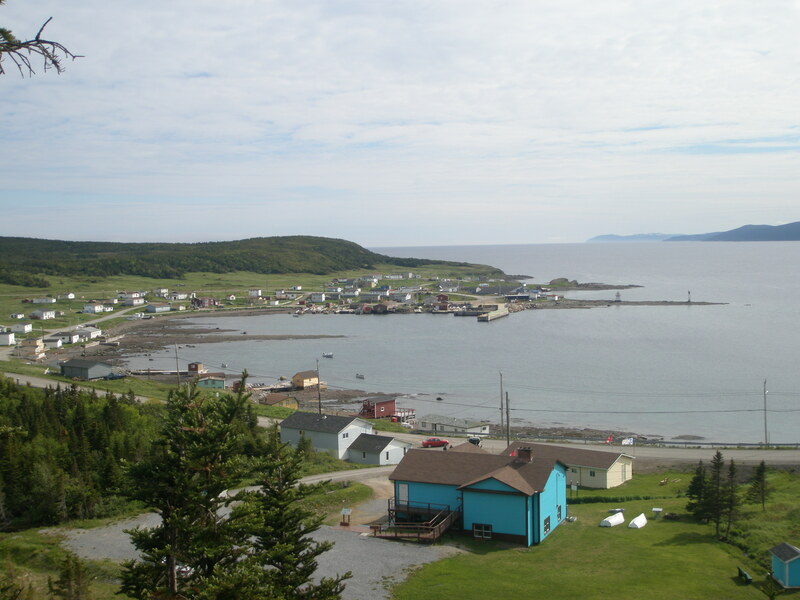 My advice to you dear readers, when the opportunity arises whether you are local or from afar take time to put Conche, NL on your 1,000 Places to Go Before You Die. Posted on August 5, 2010, in Art, Heritage, History, Landscapes/Geography and tagged b&b, Basque, black bear, Conche, embroidery, English, French, Grenfell, J. C. Roy, Newfoundland, Oven, Tapestry, Tapisserie, World War II. Bookmark the permalink. 2 Comments.